The KTuner Reflash for 05-06 RSX base model offers new life to the RSX engine with minimal cost. Available for both manual and automatic transmission models, gains of 10-12 wheel horsepower from 2000-3700 rpm and an increase of another 3-4 wheel horsepower above 3700 rpm are achieved even on a completely stock engine. The result is a much more pleasurable driving experience with plenty of torque for easy passing. 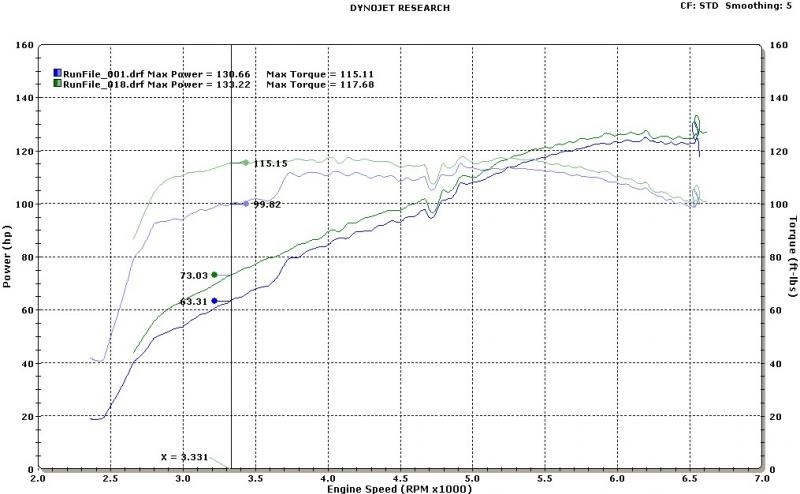 Even further gains can be seen with basic intake and exhaust upgrades. How does the Reflash process work? 1. Add the reflash service to your online shopping cart, then complete the checkout process. You will select your RETURN shipping option during checkout. 2. Print out your order confirmation at the end of the checkout process. Please include this with your package when shipping to us. 3. Remove your ECU from your vehicle and pack securely in a box to ship to us along with your order confirmation printout. We do NOT need your ignition keys or immobilizer. Please ship ONLY your ECU and printout. 4. Upon receiving your ECU, we will complete the KTuner reflash of your choice and retest your ECU for proper operation. 5. Your ECU will be shipped back to you within 1-2 business days. We will email shipping notification and tracking information at this time so that you can know when to expect your ECU. 6. When you receive your ECU back from the reflash, simply plug into your vehicle and enjoy!